Industrial electrical contractor in Romeoville, IL performs electrical projects in a range of industries such as manufacturing, industrial, food, beverage, warehouse, retail and more. Butterfield Electric consistently delivers high quality electrical projects from concept and design, to implementation and support for electrical projects in Romeoville. Industrial electrical services such as electrical upgrades, electrical retrofits and electrical systems are many of the common projects performed by Butterfield Electric. We also work in many electrical projects each year in new construction especially in commercial and industrial companies in Romeoville. Companies are constantly assessing their needed space in Romeoville. When relocation becomes a cheaper alternative, Butterfield Electric can help move your company’s production line or just the operational facility’s electrical system. Learn more about our industrial electrical services. Low and medium voltage electrical systems are the most common electrical services. Low voltage and medium voltage systems keep your organization safe with emergency systems and your operation running smoothly. In Romeoville, many medium voltage projects typically include transformers, backup generators and switchgear and circuit breakers to name a few. For companies in Romeoville demanding low voltage systems, these can include CCTV, fiber optics, fire alarms, networking projects and the like. Learn more about low voltage service projects. LED lighting systems, specialty lighting, exterior lighting or other interior lighting by a licensed contractor in Romeoville knows how to install, maintain and upgrade commercial and industrial lighting projects. Delivering the highest quality workmanship and surveying your industrial lighting project and commercial lighting project in your office or facility, we create a detailed design that is cost effective, energy efficient and takes advantage of rebates only in Romeoville! Get more information on Butterfield Electric's industrial lighting services. 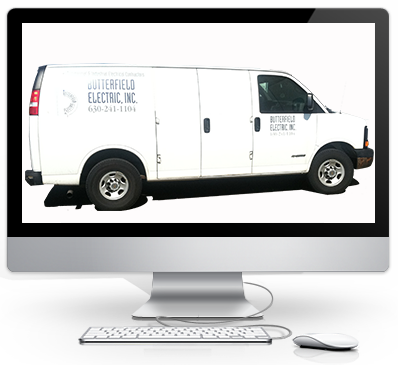 Butterfield Electric is a special electrical contractor that has the experience and technicians to work on material handling projects in Romeoville. We have the expertise to project manage the complete material handling process from concept development through design, specification and engineering. Our Romeoville electrical team, material handling team of electricians ensures only the most efficiency on every project. Learn more about our extensive material handling services. Butterfield Electric is a UL508A certified control panel design and fabrication specialist in Romeoville. Our electrical team has worked extensively as a mechanical and electrical system company keeping your conveyor lines and production lines operational. Our skilled fabrication specialists and electricians design the control panel, schematics, manufacture and quality control test the control panel. Our company develops the PLC programming delivering the best possible control panel solution for your operation. Learn more about our control panel design, fabrication services. Industrial ovens, motor control, industrial freezers, heat transfers and more are serviced by Butterfield Electric electricians skilled in industrial equipment installation and repair. Our team of electricians install, maintain and repair electrical power and wiring systems for a array of industries including industrial, food, beverage, manufacturing, electronics and more. Get more information about our electrical services on your industrial equipment.